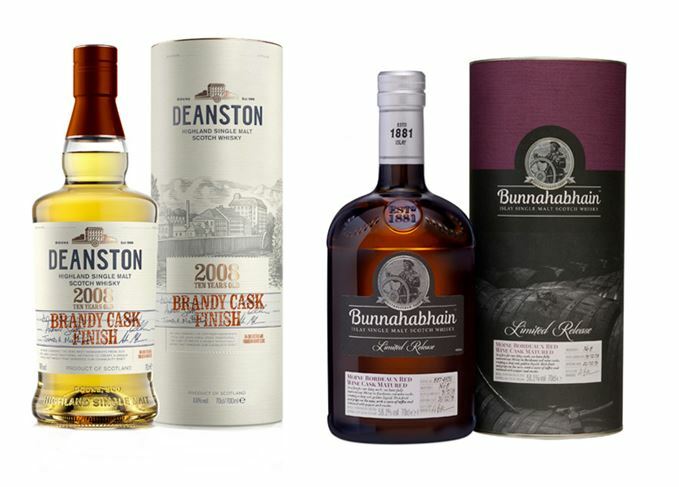 South African spirits company Distell is launching a new annual collection of limited edition single malts from its Bunnahabhain, Deanston and Tobermory distilleries. The 2018 collection is comprised of six whiskies, each of which has been matured or finished in casks seasoned with Sherry, brandy or red wine. Two of the six editions are available now, with the remaining four released in September. Bunnahabhain 2008 Mòine Bordeaux Red Wine Cask Matured is already available in global specialist whisky stores, priced around £75. The peated single malt, which is bottled at a cask strength of 58.1% abv, is fully matured in red wine casks from Bordeaux to provide ‘rich grape and peppery smoke notes’ with ‘hints of toffee and tobacco’ on the palate. Deanston 2008 Brandy Cask Finish is also currently available, priced around £60. The expression, which is bottled at 56.4% abv, was matured for seven years in American oak casks before being transferred to Brandy butts for an additional maturation period, providing ‘rich oak with a distinctive dried fruit and brandy influence’ on the palate. Blend shows strong growth in South Africa and Taiwan, while malts perform well in northern Europe. Fewer than 500 bottles of the Sherry-matured Highland single malt will be available worldwide. The refurbishment will transform the distillery into a ‘world-class whisky destination’. The Isle of Mull distillery, which produces Tobermory and Ledaig whiskies, is being refurbished. Andy Watts will be responsible for overseeing the SA group’s Scotch whisky portfolio.